Merry Christmas & See You in 2017! 38 Saturday markets, 25 yummy food markets at the University of Manchester, 3 partytastic night markets and 1 totally magical Christmas day-to-night market. We’ve also undergone a car park resurface, a greening via Incredible Edible Levenshulme, hit an unbelievable 10,000 Twitter followers, did our longest ever market, had more live music on than ever before, took part in the Levenshulme Food and Drink Festival and even had a fun day out to the Levenshulme Beer, Gin and Food Festival at the Klondyke Club. It may have been a black hole of a year in many other ways, but 2016 has been pretty special for us. We’d like to say an enormous thank you to all of our talented and hard-working traders and to all of the loyal, wonderful people who turn out whatever the weather every Saturday. 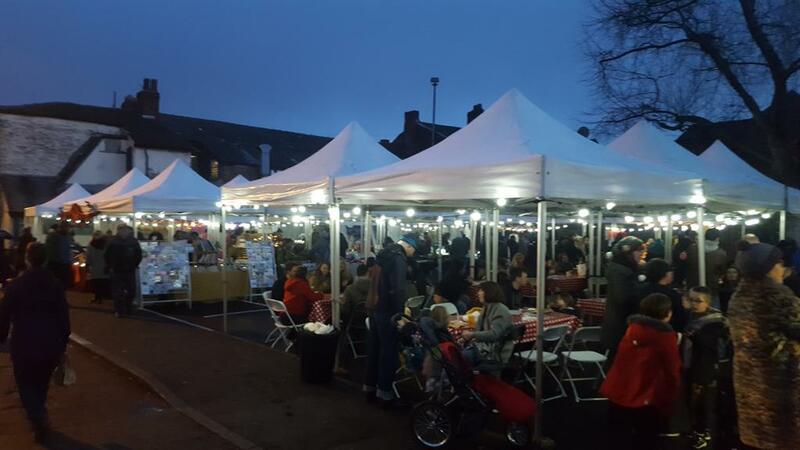 It’s Christmas and we’re feeling soppy, so a big wet thank you to all of the tiny tots, dogs in jumpers, adorable families and the Levenshulme community too for making our market feel so special. We put up the stalls, but you bring the feel goods. We’re off for our winter break and will be back with bags of enthusiasm and lots of exciting plans in March 2017. Have a fabulous Christmas and New Year! Do you want to join the best market team IN THE WORLD?